Snapchat introduced Stories this morning. Oh, wait, I mean Instagram. Let’s try this again. Instagram introduced Stories this morning, a feature that 100% copies Snapchat’s Stories feature. With Instagram Stories, users can upload different clips and shots into the same Story, then share that Story with whoever they want on Instagram. If this sounds like Snapchat Stories, it should, because it’s the exact same thing. Of course, users can draw on top of clips or photos, as well as add stickers to make yourself look super creative. Additionally, Instagram makes it clear in the announcement that your Story follows the privacy settings of your account. If your account is private, your story will be private. However, this next part is where IG Stories differs from Snapchat Stories. As Instagram states, “you can also easily hide your entire story from anyone you don’t want to see it, even if they follow you. When watching your own story, swipe up to check out who’s seen each photo and video. You can even choose to feature a particular part of your story by posting it on your profile.” On Snapchat, when you post a Story, it’s visible to everyone who follows you, even if you don’t follow them. On Instagram, it appears that they will allow for better control over portions of your Story, which is good. 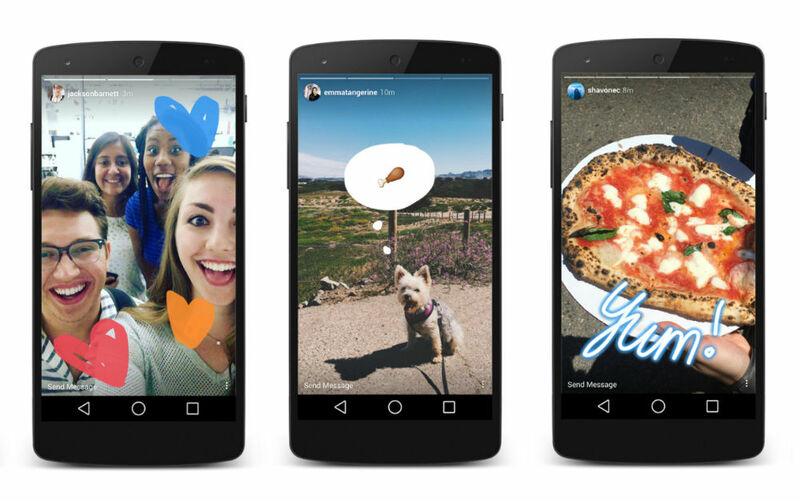 Instagram Stories is rolling out over the coming weeks for Android and iOS. Have at it!